You’ve probably seen Simon Miller bags all over Instagram without even noticing—aesthetically they’re beautiful, simple and come in mini structured shapes. But in the sea of popular Cult Gaia wooden bags, and overpriced grocery net totes, Miller has taken the alternate route by straying away from being a typical LA fashion brand and providing a refreshing change of pace: an “it” bag that’s also timeless. Launching in 2008 as a men’s denim brand, designers Daniel Corrigan and Chelsea Hansford branched out to create handbags because of their knowledge of sourcing quality fabric from Japan, and desire to create something conceptual in the handbag market. This style, the Bonsai bag, has become the brand’s hero piece because of its contemporary classic approach, and is now offered in two sizes and trendy shades like this turquoise version. This bag in particular caught my eye because outside of your everyday work bag, there’s always a craving for something carefree to wear on the weekends or at night that adds an element of fun. 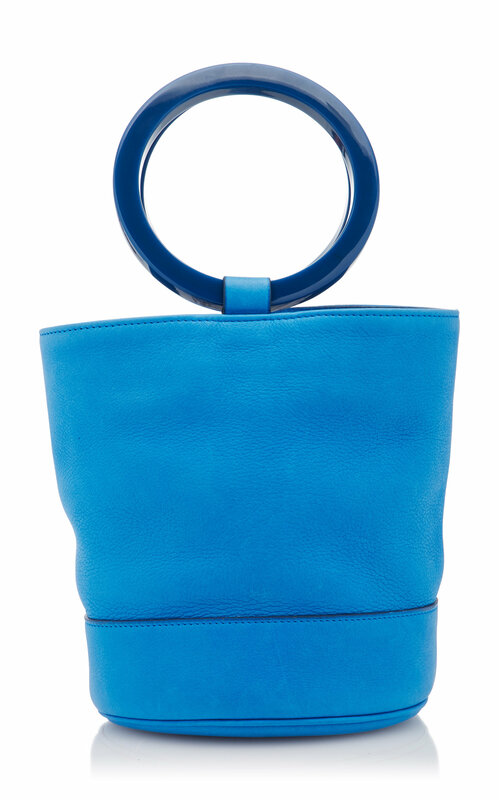 And while Mansur Gavriel may have put the bucket bag on the map, Simon Miller has elevated it to make it cool and even more so covetable. At $590 it’s less than rent money yet somehow the perfect mid-range price point for a bag that you’ll wear literally every weekend this spring and summer. It’s irresistible and I can guarantee you’ll regret it if you don’t buy one soon.